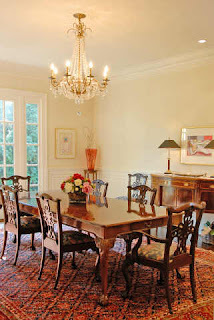 Ever since my post on my dining room dilemma, I have been a bit dining room obsessed. 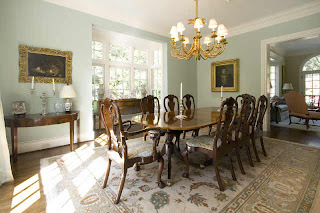 I decided to look through the Atlanta real estate postings to see what fellow Atlantans are doing with their dining rooms. 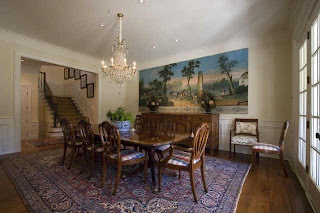 Of course, this is Atlanta, home of the 'house proud', and very formal dining rooms are alive and well. 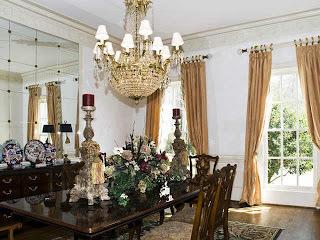 Many of the dining rooms involve an ornate crystal chandelier. There is a lot going on in this dining room! The chandelier seems a bit big for the table, but maybe it is just the perspective of the photo. This room was probably decorated in the 90s (or even the 80s) based on the window treatments and the color of the walls. 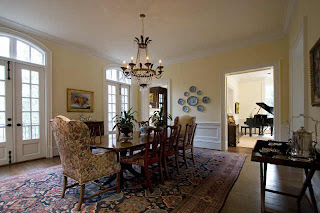 Most of the dining rooms in the listings these days have neutral colored walls, or light at the very least. I like the striped window treatments in this room. This is from a listing that has been on and off the market for years. This chandelier seems a bit big for the room. Or, maybe the table is too small for the room! 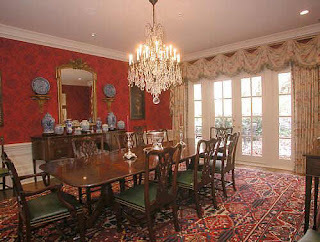 This is an interesting dining room - it is unusual to see a glass top table with such formal chairs and sideboard. This is from a manor that has been on the market for years. 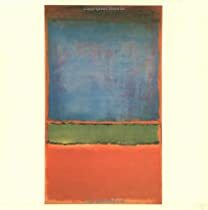 The price: $16.5 million. It used to be Atlanta's most expensive listing, but now there are several homes that are priced at $20 million. 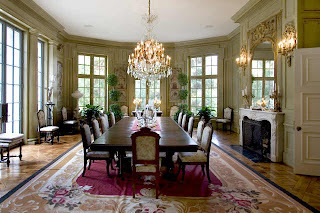 Now this is a banquet sized dining room! Yes, this is actually from a home for sale in Atlanta! 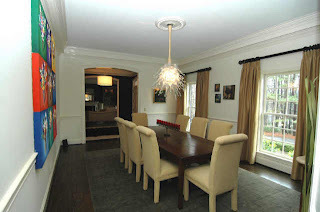 Another style that seems to be very popular in the Atlanta real estate listings is the empire chandelier. 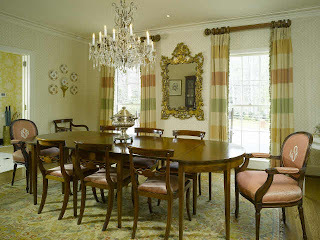 Some are heavier on the crystal, others heavier on the gilded metal, but all look quite pretty in a formal dining room. There were a few Murano or Venetian style glass chandeliers on the listings too. 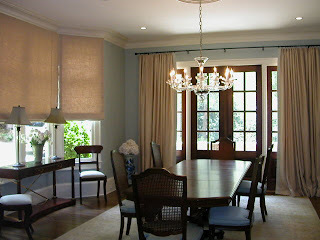 After looking at all of these dining rooms, the style that really appeals to me is the simpler empire style chandelier. It seems so elegant and versatile to me, neither too formal nor too casual. As a side note, what did people do before the real estate listings were online? 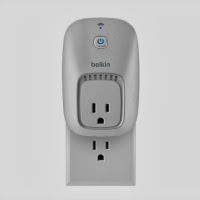 They certainly provide hours of entertainment for me, and enable a legal way to peer into some of the lovely homes in Atlanta. 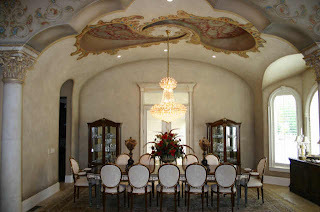 That multi-arched entryway into the Atlanta home's dining area is amazing! So is the ceiling above it. Regional cultures are so different. Up north here, in yankeeland, I cannot imagine most of these homes being built. The old manor, yes, by the Rockefellers, but the new ones, no way. Many of the chandeliers seem way too big and overblown to me, made for a large theatre, rather than a large house. 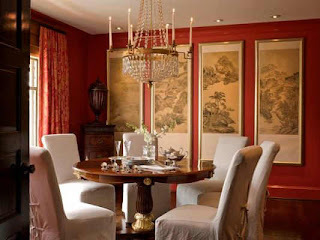 That said, my favorite is the red room with the japanese prints and the simpler chandelier. But it's a much less grand room, and the table is completely unlike yours. 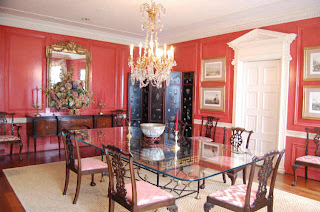 After looking at all the wall colors, I have to say that if you're going to to have a glass and gilt chandlelier, your richly colored walls would show it off well. 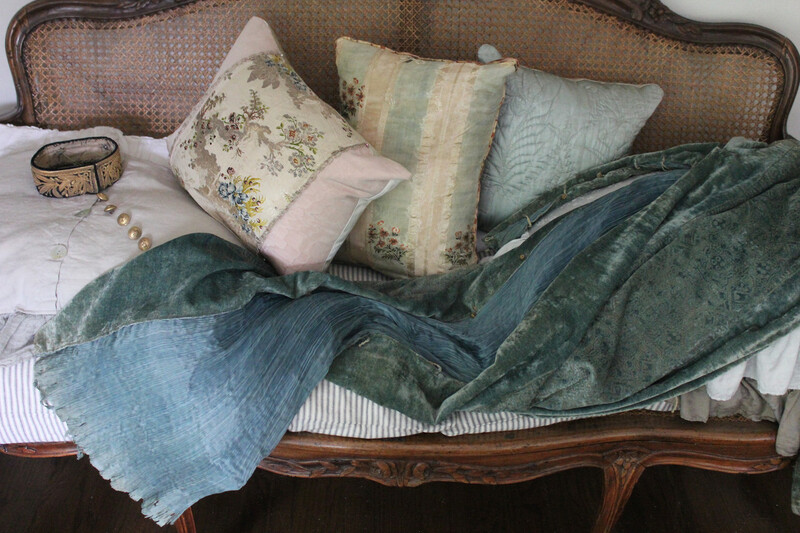 I'm a big fan of textiles on a table, to break up all that wood, protect the top and tie it to other things in the room. 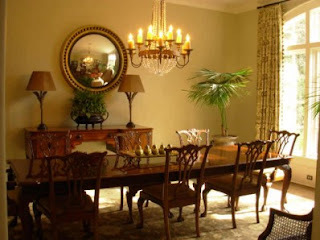 Balsafir, it interesting to read your perspective on these dining rooms. 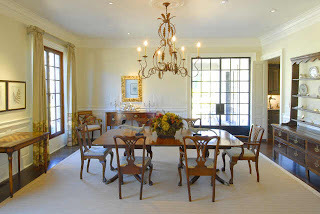 I must admit, most of these dining rooms come from homes in the $3 million and up range, where the dining rooms are larger because the homes are larger. A lavishly decorated dining room is just part of the package. 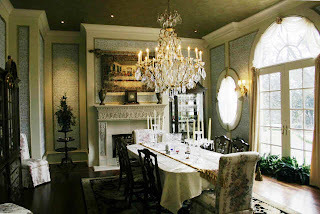 You certainly would not find as many dining rooms that are as ornate as these in the $1.5 million and lower, but you will still find them. I have a friend whose home is on the market, and she converted her dining room into an office. The biggest feedback on her home from realtors: no dining room means no offer. I have another friend who was real estate shopping in Southern California, and she was stunned that most of the homes in the town where she was looking had pool tables in the dining room. The realtor thought it was odd that she pointed it out! great post. you are lucky, you have so much better homes. 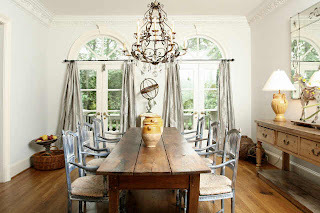 one of my favorites is toward the bottom, blue curtains, white walls, wood table, kind of swedish looking. 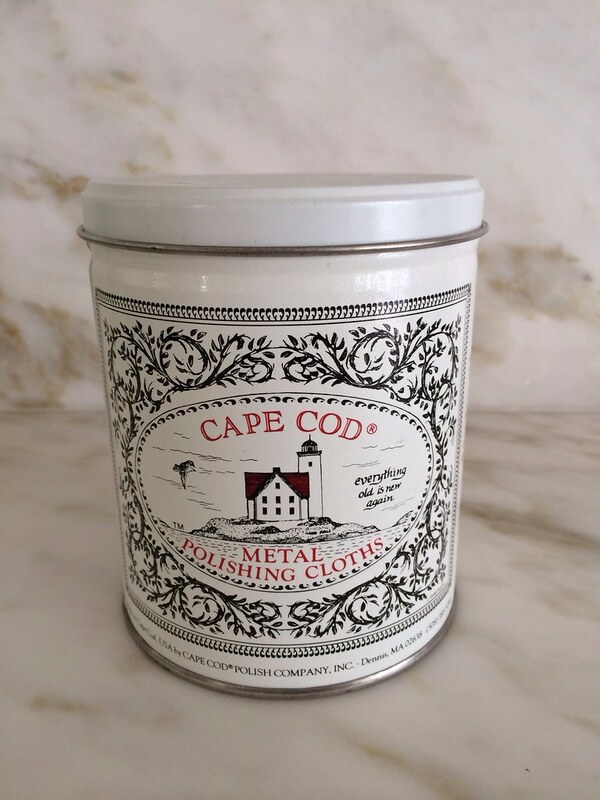 Such fun to peek into real homes, and you have such a great selection here. I'm also leaning toward the elegant empire chandelier, although it's great to see how other styles would work in actual settings. Wow, pool tables? They must have very different dinner parties than we do. I've only been in a couple houses even close to that price range. Most higher end homes up here are more like a million locally. But they're really into wrought iron, or the alpine antler thing(which I don't really love). Its really regional style. But I too want an empire gilt chandelier(just a tiny one). 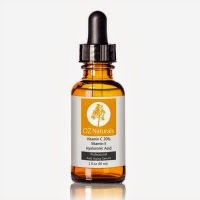 Thanks so much for the sweet comment and for adding me to your blogroll... I really appreciate it! 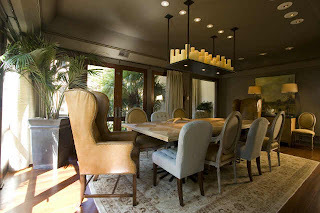 Wozie, these are some dining rooms! I think it is great if you can have a formal dining room for fancy dinner parties, but for most of us it is a bit impractical! Speaking of pool tables in the dining room, I just did a post today on a dining room table that the top lifts up and turns into a pool table! Now that seems much more practical than an entire room devoted to Thanksgiving dinner. I like the blue dining room with the glimpse of the black & white floor just beyond. 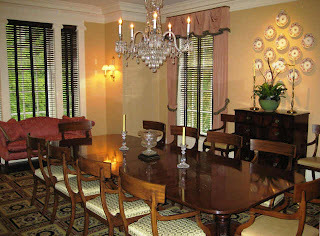 These Atlanta dining rooms are definitely much more traditional and formal than most you get down here in Miami. Even the pricey houses are more clean cut and modern looking. Seems like not as many antique lovers down here. Thanks for posting so many rooms. 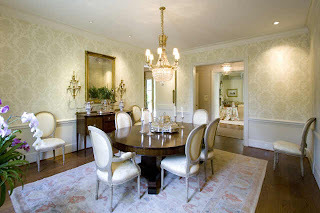 Love these dining rooms...we will have this on the mind for a while after all these inspiring photos!! dear things - beautiful images as always. Actually I think we're all secretly real estate voyeurs, dont you!!! They are all lovely. I have a concern. What are these light fixtures going to look like without incandecsent light bulbs. I have a houseful of scounces and some have shades, some not, but what in the world will I do. I daydream about stockpiling bulbs. I have a beautiful floor lamp that was a wedding gift to my parents and the central 3 way bulb is outsized, much larger screw in...I recently found one at Walmart of all places. Has anyone else worried about this? I guess serving happy meals in those rooms are out of the question. They look very serious, to me. I guess I want to have more fun while I eat. Happy Mother's Day! Hope you had a wonderful day with your family. 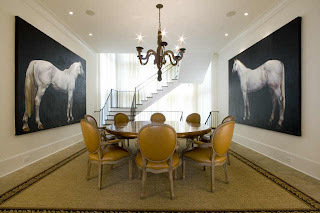 I adore that dining room with the yellow pops and the huge dramatic horse paintings. So fab! 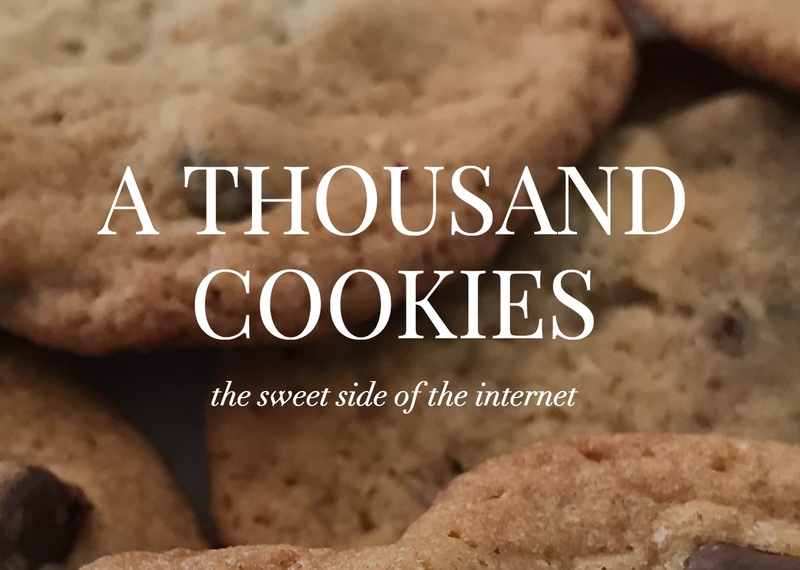 Love your beautiful blog! It is a daily read for me! What I want to know is what do these people do for a living cus I want to do it too! !